Discover the dramatic transformations of Chicago’s most rapidly booming neighborhood on this walking tour. Over the course of this two-hour excursion, you’ll get a glimpse of Fulton Market’s meatpacking past and enjoy a taste of its gourmand present. 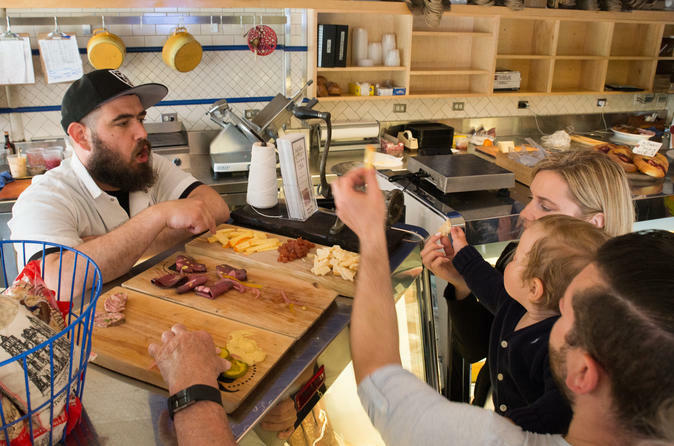 We call our Fulton Market food tour the “Factories to Calories” tour because of the area’s shift from a place of production of appliances, furniture and meat products to a hub of consumption of food and drink. The walking tour starts with a grand view to see the train and highway systems that made Fulton Market into a vital industrial and meatpacking district throughout much of the 1900s. From there, we’re off on a one-mile jaunt through a neighborhood defined by change. As recently as the 1980’s and 90’s, Fulton Market was home to underground parties, drug busts, and low-rent art galleries. Today instead, you will find high-end retailers and offices of massive corporations like Google and McDonald’s among historic architecture.